Fallout 4 is coming, and those people with mobile Apple devices have been helping to pass the time until launch by playing Fallout Shelther. However, some people might have missed out on some of the previous Fallout games and somehow managed to not pick them up for ludicrously low prices during Steam sales. Bethesda is thinking of you. Beyond the games, though, it’s the packaging that does it for me. Most people have these games thanks to constant sales and bundles online. However, these games all come neatly packaged inside a Fat Man mini-nuke. Not only is the box a mini-nuke, but it even makes audible bomb sounds. I don’t care if I already own all these games on PC, it’s time to buy them all again just to have that adorable Fat Man. 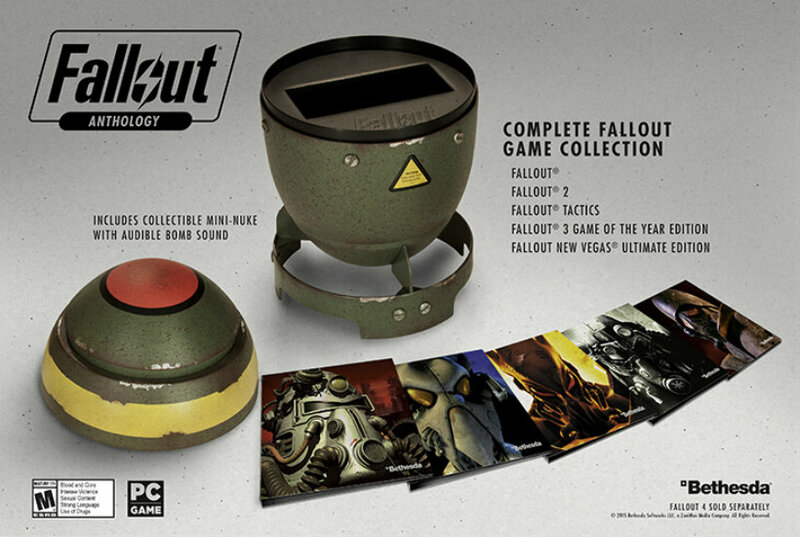 Plus, they are even saving space inside for your Fallout 4 game disc. Bethesda seems to be hitting all the right notes with their build up to Fallout 4. A mobile game that doesn’t push the micro transactions but still makes a ton of money because people are having fun? A promise that the game won’t be at two E3s, but is coming out this year? Plus a way for people to catch up on any games they missed with a cool anthology that looks like a Collector’s Edition? Oh, and that incredible Pip-Boy Collector’s Edition of Fallout 4? So much awesome – well done Bethesda; I feel like you are speaking directly to the hearts of gamers. Now prepare for console gamers to demand the same anthology.